AFP pursuit cars roving this holiday season. AFP VEHICLES ARE ON THE ROAD THIS HOLIDAY SEASON TO MONITOR AND DETER ROAD ACCIDENTS. The AFP, also known as the Australian Federal Police, has a range of motor cars to monitor traffic behaviour each holiday season in an effort to promote safer driving practices. 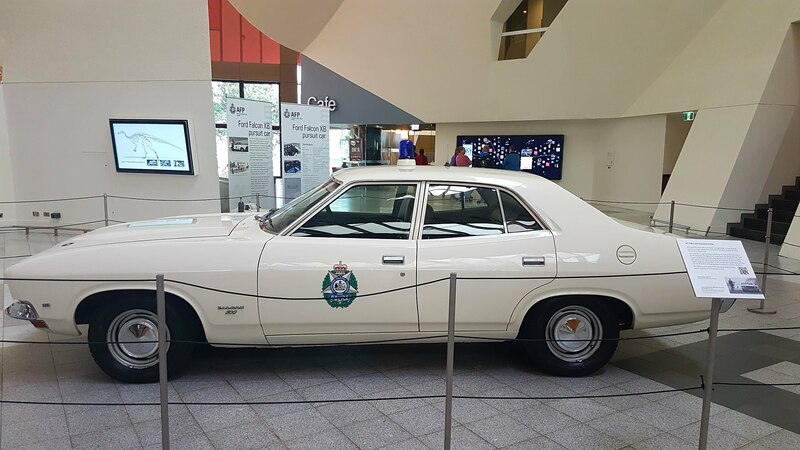 The range of police motor vehicles on the road are sometimes known as ‘wolves in sheep’s clothing’, according to the latest museum exhibit at the National Museum of Australia (NMA). The cars look like an ordinary passenger vehicle but have mega-engines under the hood for emergency needs. 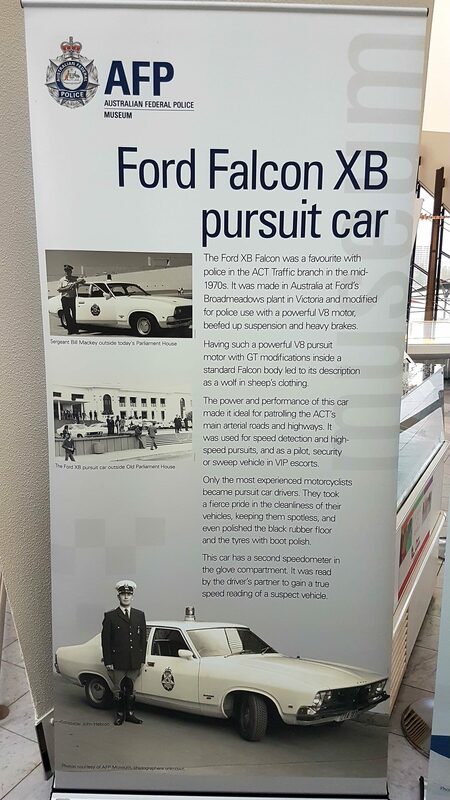 One example currently on show at the NMA is the 1974 model Ford Falcon XB pursuit car. 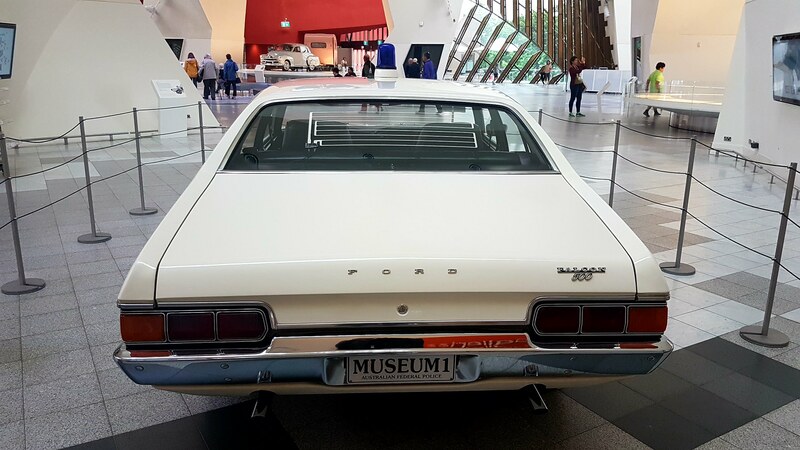 It was produced at the Ford factory in Broadmeadows in Victoria in September 1974. The vehicle was modified by for police use with a powerful V8 motor “beefed-up” suspension and heavy brakes. 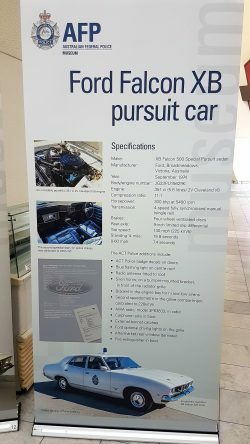 AFP pursuit car at NMA. 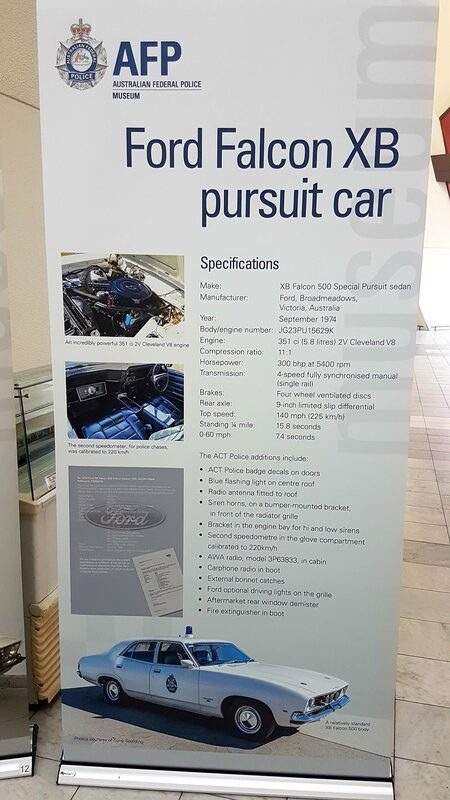 The pursuit car is a 4-speed fully synchronized manual with 300 bhp at 5400 rpm. 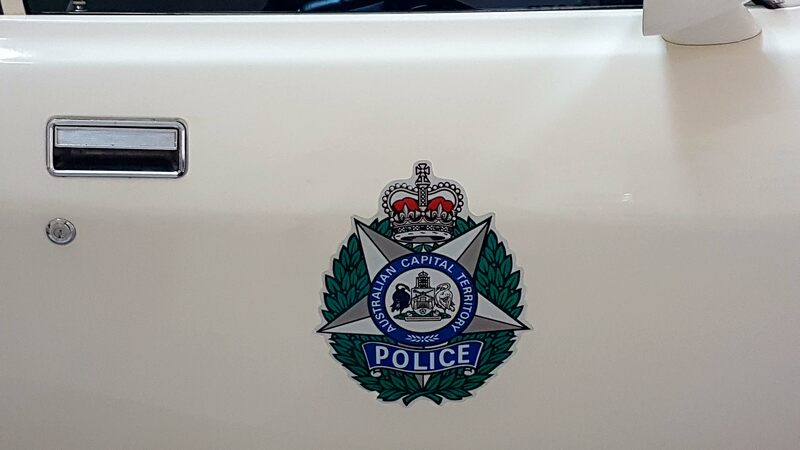 The speed take-up is listed as 0-60 miles per hour in 74 seconds.
. ACT Police badge decals on doors.
. Blue flashing light on centre roof.
. Radio antenna fitted to roof.
. Siren horns, on a bumper-mounted bracket.
. Second speedometer in the glove compartment calibrated to 220 kilometres per hour.
. AWA radio in cabin.
. Carphone radio in boot.
. Driving lights on the grille.
. Aftermarket rear window demister.
. Fire extinguisher in boot. 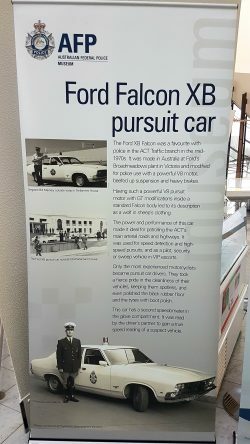 The AFP pursuit vehicle on display. 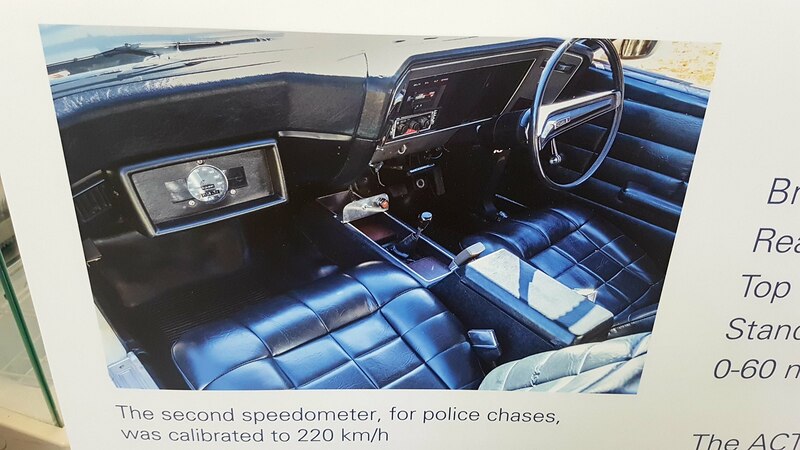 The second speedometer in the glove compartment was read by the driver’s partner (sometimes called the ‘navigator’), to gain a true speed reading of a suspect vehicle. 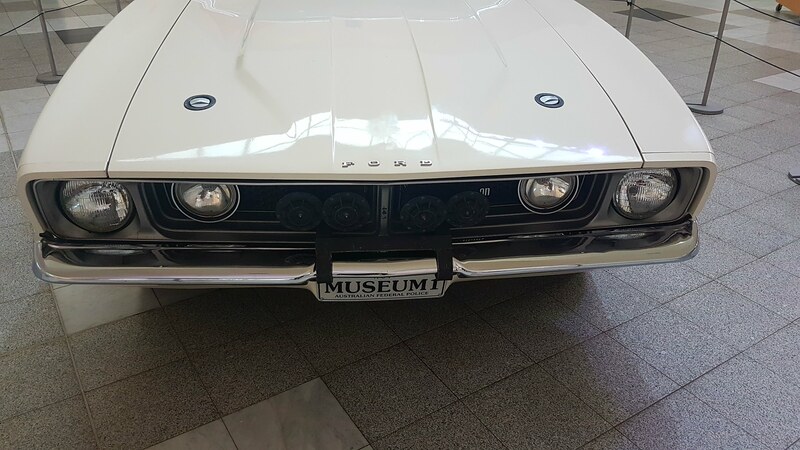 The car’s front end with ‘Museum’ number plate. Rear end of the AFP pursuit vehicle. Even though good driving skills are required to be a patrol vehicle driver, “only the most experienced motorcyclists became pursuit car drivers”. Text copyright by Fiona Rothchilds and AFP/NMA. Photographs copyright Fiona Rothchilds 2017.